A dreamy Mumbai wedding, held at Four Seasons Hotel, Mumbai that showed us what classy weddings are made of. Premium décor that will leave you inspired, immaculate planning by Party Cruisers with a spotlight on elegance and outfits put together tastefully puts this wedding in the high inspiration category. Right from this gorgeous bride’s red Gauri and Nainika cocktail dress to her blush pink and aqua wedding lehenga, each outfit made us want to throw multiple heart eyed emojis at her! For real! Surbhi and Ankit organized their wedding with fine attention to detail and paved the way for a new level of wedding inspiration that spells flawless! 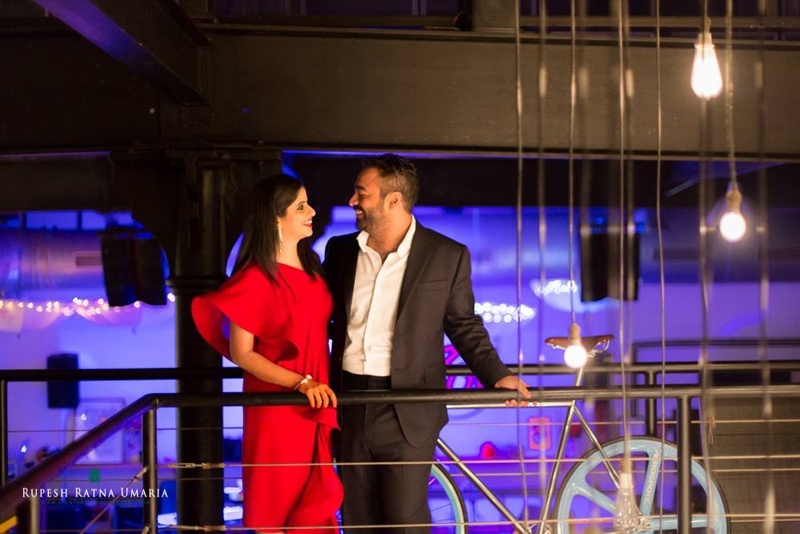 Ankit and Surabhi got together and planned their dream wedding in Mumbai that began with a classy cocktail party held at Café Zoe in Lower Parel, Mumbai. The worn out walls, raw suspended yellow-lit bulbs with mandatory mojitos were perfect to kick-start their wedding celebrations. This kind of setting demanded an outfit that stunned and Surbhi did perfect justice in her deep vermillion red Gauri and Nainika gown while Ankit looked sharp in a carbon black Armani suit. A DIY mehndi + sangeet ceremony at Sofitel, Jyran Mumbai followed suit. With the help of her local decorator and brilliant creative touches from the gorgeous bride herself, their mehndi + sangeet was one naach-gaana filled, fun event. The fuchsia lehenga paired with a leheriya dupatta bought from Zari, Jodhpur was a brilliant outfit choice for this DIY marigold mehndi ceremony! The Four Seasons Hotel, Worli saw their magnificent wedding come to life. After surfing the internet endlessly and having oh-so-many conversations on décor details, floral arrangements and centrepieces with their wedding decorators Party Cruisers – both, Surbhi and Ankit along with the ace decorating team at Party Cruisers whipped up a wedding ceremony that was as beautiful and elegant as it gets. Surbhi and Ankit incorporated two of the biggest wedding trends in their wedding décor and we were left mesmerized! A stunning chandelier mandap with a floral wall backdrop – absolute class! Simple elements like these made their outdoor wedding at Four Seasons Hotel, Worli so classy and chic. The reception tables were graced in hues of white and gold with topiary styled centrepieces – dreamy, bright and beautiful!